The UCCE Placer/Nevada office has a few publications available for purchase at the office (cash or check) or purchased on-line to be shipped to you. Embryology, An Eggciting Adventure...Leaders Guide - The 4-H Embryology...An EGGciting Adventure is a fun, rewarding and educational project. The study of embryos is a great way to observe the development of life in just three short weeks. The project provides numerous opportunities for your children to learn, through observation and hands-on activities, the value of life as well as information about chickens, eggs, and embryonic development. The lessons can be adapted for use in after-school programs, school classrooms, and 4-H project meetings. 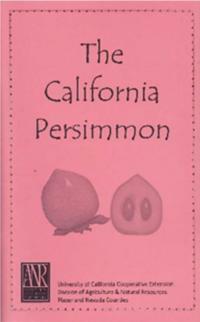 The California Persimmon Recipe Book- Persimmons are in the markets from late September through December. They are usually picked when mature and allowed to ripen, although will continue to ripen after they are picked from the tree. The Grassfed Gourmet Cookbook - The Grassfed Gourmet Cookbook is not just about the recipes; it's about the advantages and attributes of eating foods from animals raised on pasture.